My Name is Penny Mae Purdie and I live in Mackay, Queensland….Australia. 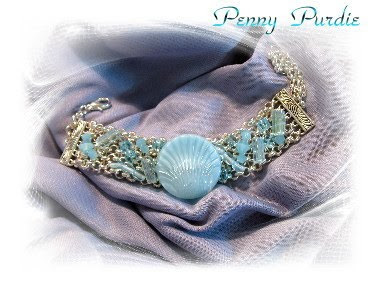 At present I have one website, Penny Purdie. My eldest son is working on another site for me, he is at Griffith University studying this very subject in Brisbane. Family and friends ask is there anything I haven’t tried when it comes to being creative with your hands. I have done alot of different things but the ones that have really clicked with me are Jewellery Making and Silk Painting. It started with Sewing then came Fabric Painting, Folk Art Painting, Decoupage, Paper Tole, Mosaic, Silk Painting (which is so stunning with its colours and feel), Glass and Ceramic Painting, then the greatest Jewellery. Never thought I would be a teacher though, after learning with my Silk Painting Teacher for more than a year she announced she was leaving town and wanted to know if I would take over the classes. My answer was no, that I could not see myself ever teaching, I just wasn’t confident enough. Then our kids got older and were at school and Spotlight opened a new Store and they were asking for tutors. My friends and family were telling me to do it, so I submitted my resume and photos. Talk about nervous, but I got the job and taught most of the above at Spotlight for 4 years. Adults were who I taught during the week and children over the School Holidays. Kids are fearless when it comes to colours etc, they come up with amazing things.After having a year off from teaching I was asked if I would teach Jewellery Making Classes at the Bead Store in town called “Just Bead It”, I accepted and enjoy it immensely. Teaching…it’s a great way to meet new people…get them addicted…swap ideas…help and inspire each other…just socialize. My creative process usually starts with me imagining something in my head. Which can be inspired by a shape I’ve seen or a colour combination I see in nature or just about anywhere, sometimes it just simply comes to me. Then I draw it, which is another thing I love to do. While drawing I write notes about materials to use, ideas in general to make the piece hold together etc. I might make and remake the piece a few times until I am pleased with the end result. While designing and actually making the piece I like quiet and no distractions. This is sometimes hard to get with a husband, son, nephew, 2 dogs and a cat around. But the humans are pretty good and know when to leave me alone, can not say the same for the animals. Most of my creative time is when the family is at work and I am home alone, my teaching is part time only. Don’t get me wrong I might need peace and quiet to create and design, but I love music and I like it loud, which is the only way to enjoy good music even at 46 years old. I love modern music, county rock, rock and roll, Latin and just about anything that makes you feel and want to dance. Another thing I enjoy is reading, such things as Creative / Jewellery books and Novels, especially at night when I can’t get my brain to shut down so I read thrillers and Science Fiction, this usually makes me sleepy. Though I have come up with some good ideas while trying to get to sleep. Keep a note book and pencil on your bedside table. For some time now I have been hooked on Wire Work Jewellery, love love Wire especially with Czech Beads and Vintage Buttons. The things you can create are endless, some times I get so involved that when I look up at the clock the hours have just flown by. If it’s a piece that requires say alot of repetitious wiring or lots of Brick or Ndebele stitching etc I will pace myself and take breaks so I don’t get a sore back or neck. Recently my youngest son Graduated from grade 12, his school days are over, and he is having a year off then on to University. 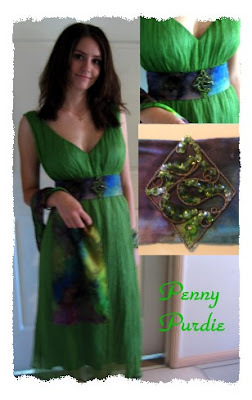 For his Graduation Formal I decided to wear this Green Silk dress I already had but had never worn. But I wanted to dress it up. So I hand painted some Silk, made a band for under the bodice and a shawl. The Bodice Band needed something so I made a Jewellery Piece for the center and a pair of Earrings. The Silk turned out beautiful I was very pleased with it, and I did not spend a fortune on a dress I would probably never wear again, I just dress up a good casual one. Making complete Accessory sets like that would be my ultimate dream occupation. When people commented on my outfit I even did a little bit of boasting.Silk Painting took up alot of my time before Jewellery. With the help of my husband I even designed a Silk Painting Frame/Stretcher. It has folding legs, the frames length was adjustable and level on all four sides and for awhile I had a Patent on it, never thought I would do something like that. Unless you know something about painting silk this description may not mean much. But I myself was not 100 percent satisfied with the frames available in Australia, so I designed one. Necessity being the mother of invention. They say (whoever they are) “it pays to advertise”. My friends and family are always telling me I need to wear my own jewellery. I don’t wear much jewellery because I live in a very humid climate and it annoys me. But I am starting to wear mine, and people are asking me about it. So flaunt it girls, it does pay to advertise. A former student, and now great friend, and I had a Jewellery Party at my house with Wine and Cheese etc. It was on a Saturday afternoon we sent out Invitations, and it was great. Caught up with friends, met some new people, sold plenty of jewellery it was a complete success. Give it a try ladies. The photos I have included are some of my favorite pieces at the moment, the girl in the photo is not me. Wish I could say I’ve held my age well, but this a friend Rachael Kaye. Thanks Rach. Rachael also modeled my bracelet that Cyndi (editor) admired from the Swarovski competition. 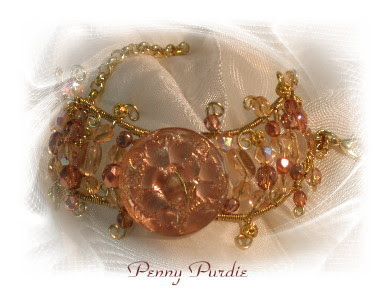 The Peach and Gold Cuff has a Vintage Czech Button as its centerpiece, so does the Blue Shell and Chain Bracelet. 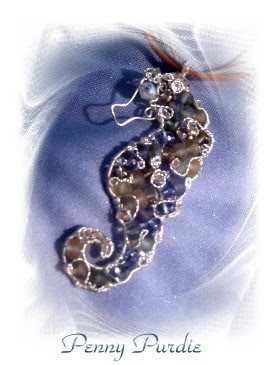 The Seahorse is done with Rondells and Japanese 2 cuts. 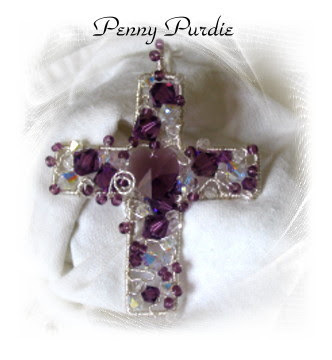 The Purple Cross I call “Heart and Soul”. 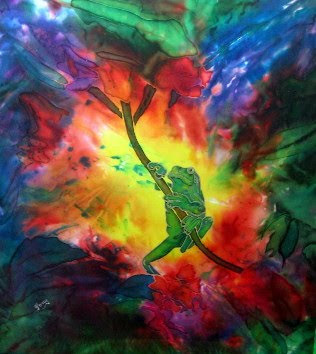 The Silk Painting of the Frog’s Journey is a favorite of mine because of the style of background, I never know what I am going to end up with when I do this technique. I thought I new everything about your art but I was wrong. Its easy to miss the big picture of your work when I was so close to it. I'm really proud of you mum!